Charlie Blackmon said thank you to the Rockies quickly and efficiently (does he know any other way) after announcing a contract extension earlier in the day. Meanwhile, Jon Gray was as efficient as ever at Petco Park, where he’s quickly establishing a home away from home dominance. The Rockies cruised to a 5-2 win in game three of a four-game series in San Diego on the backs of those performances. In Blackmon’s first at-bat as a $100-million man, he logged a base hit and scored a run. 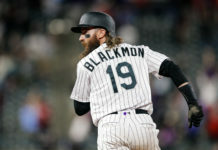 Blackmon led off Wednesday’s contest with a single, then came around to score after a single by DJ LeMahieu and a double by Nolan Arenado, just hours after news broke that he had signed a contract extension with the Rockies that could keep him in Colorado through 2023. Rockies fans, no doubt, are hoping the first innings of LeMahieu and Arenado — who are free agents in 2019 and 2020 respectively — are harbingers of similar long-term deals to come. After their hits, Trevor Story drove both in with a one-out, ground-rule double off Clayton Richard. Blackmon and LeMaheiu strung together back-to-back hits again in the top of the second, this time with two outs. Arenado didn’t get to drive them in this time, though, as Richard (0-1, 4.50 ERA) offered him a free pass after running the count to 1-1 against the three-time Silver Slugger. Ian Desmond made Richard pay, driving a single to center that scored Blackmon and LeMahieu to run the score to 5-0. Blackmon and LeMahieu each ended the night 2-for-5 with two runs scored. 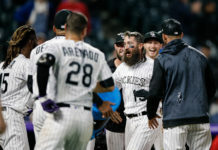 While Rockies fans were dreaming of a future where Blackmon, LeMahieu and Arenado lead Colorado to multiple World Series, Gray (1-1, 2.45) was quietly reminding them that those offensive stars will need his help to make that happen. The big right-hander on Wednesday aimed to bounce back from a rocky Opening Day start in Arizona and did so by cruising through the first four innings, allowing just one hit over that span — a single by Cory Spangenberg. Spangenberg also earned San Diego’s second hit of the night, a leadoff double in the fifth. LeMahieu gave Gray a big defensive boost in the inning, snaring a sinking Matt Szczur liner in the hole between first and second. The play held Spangenberg at third, after he had advanced on a Freddy Galvis ground out. After striking out Colorado native Chase Headley to open the sixth, Gray hit Jose Pirela on the elbow. Carlos Asuaje singled to give San Diego their first real threat of the night, but Gray buckled down to strike out Eric Hosmer and get Christian Villanueva to foul out to catcher Tony Wolters. Villanueva was 0-for-3 against Gray after hitting a career-high three home runs and five RBIs one night prior in an 8-4 Padres win. Gray ended the night with seven shutout innings and seven strikeouts, scattering just four hits and walking none. Gray entered the game with a 40:8 strikeout-to-walk ratio and a 3.21 ERA at Petco Park over his previous 28 innings there. Reliever Jake McGee spoiled the shutout in the eighth, allowing a one-out walk to Pirela followed by an Asuaje single just past the glove of a diving Story. McGee induced a potential double-play ball on Hosmer, who chopped a ball deep to defensive replacement Ryan McMahon at first base, but the pitcher got crossed up covering first base and Pirela scored as the ball sailed past him. Hosmer then scored on a Hunter Renfroe line-drive single up the middle off Bryan Shaw, who relieved McGee. 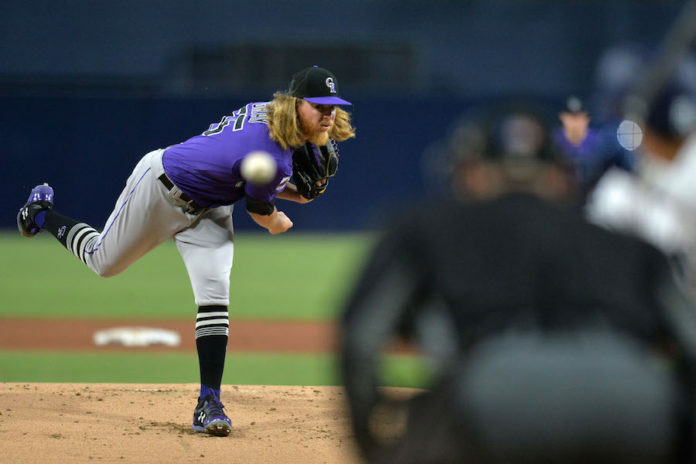 San Diego’s two runs in the eighth called for Rockies closer Wade Davis in the ninth. Davis walked Galvis to start the inning, but got a flyout and double play to earn his third save of the year. The win levels Colorado’s record at 3-3. San Diego falls to 1-5. Colorado leads the four-game series 2-1 through three. UP NEXT: Tyler Anderson (0-0, 27.00) will try to secure the series win for Colorado in an afternoon affair. Like Gray, Anderson is seeking redemption from a rough first outing. He will face Joey Lucchesi (0-0, 5.79). First pitch is 1:40 p.m. MDT.